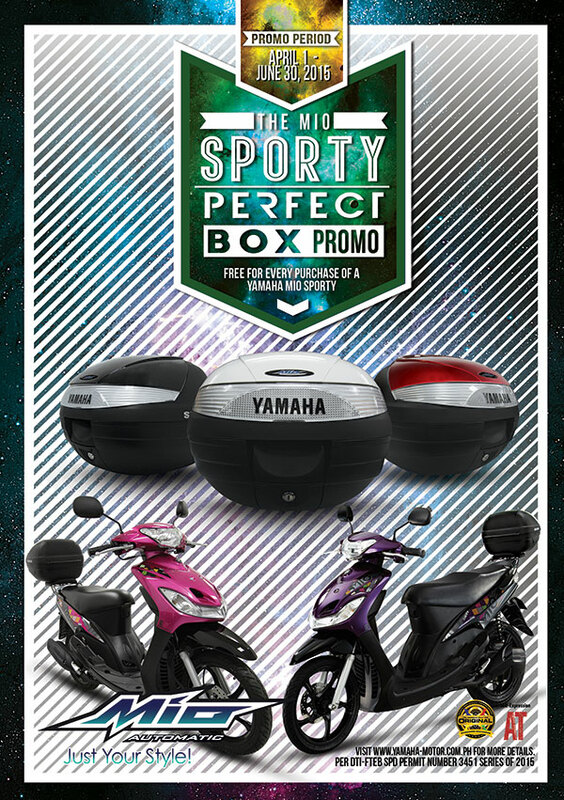 The Mio Sporty Perfect Box Promo is available free with your every purchase of a brand new Yamaha Mio Sporty either in cash or installment basis. Get one today and bring home more than just a Mio Sporty. Promo is open to customers who purchase a brand new Yamaha Mio Sporty on cash or installment basis. Customers who will purchase a unit of Yamaha Mio Sporty within the promo period will automatically receive one (1) luggage box for free. There are no limitations on how many Yamaha Mio Sporty units a customer can buy. Free items can be redeemed on the date of purchase or within 60 days from the end of the promo period. Promo is open to all Yamaha 3S Shops and Multi-brand Outlets Nationwide. Promo period is from April 1, 2015 to June 30, 2015.